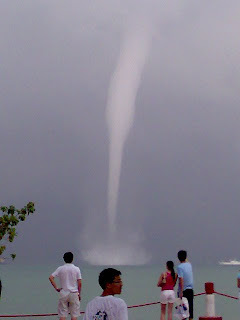 A giant water spout descended on East Coast Park today. We were having brunch at Scruffy Murphy's, and suddenly the sky darkened and there was a frightfully loud clap of thunder, followed shortly after, at around 1.05pm by this amazing phenomenon. It ploughed through a little boat that was in its path getting bigger and bigger. I ran and quickly snapped a shot, then got a bit freaked out and ran back to safety before it started pouring. Ah well, very dramatic and exciting - just the sort of thing to pull one out of the shocker this morning's rugby game. If only the All Blacks hadn't worn those stupid blue jerseys. Everything would've turned out ok.